Most people who we talked to here were always skeptical but after a few weeks of trying the Bulletproof Diet, they were converted. The words I hear from the true believers before the diet was "lack of energy", "super tired", "lack of focus, after a few weeks of the diet they said words like "changed my life", "more energy and focus","enjoying many things I didn't used to enjoy". So for most of us who aren't world-class athletes, would you give up a chance to get to your optimal performance in your career, work or passions. 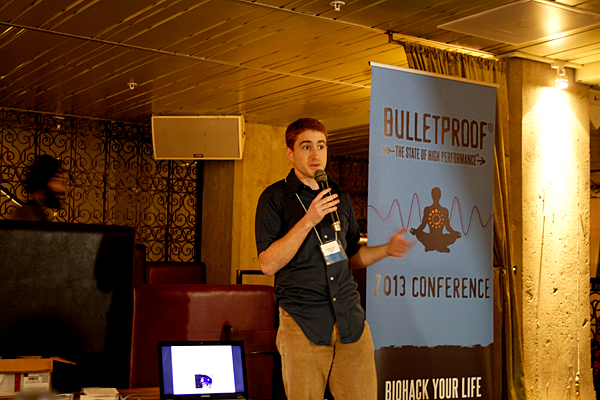 The theme of the 2nd day of the Bulletproof Conference "Bio-hack Your Life" was "Life Changing". 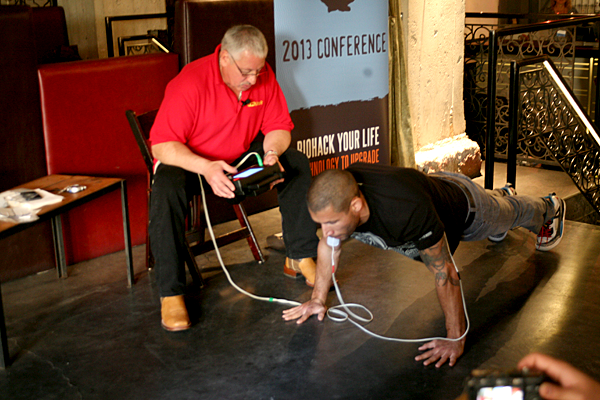 Day one of the conference, Jay Schroeder and Charles Maka demonstrated some tools like the EVO ARP POV Sport instrument which allows the body’s systems to respond more efficiently to work. In Day two, Jay and Charles continued demonstrating the effectiveness of the POV because a lot of the people in attendance wanted more demo work and individual work with both Jay and Charles. I describe Jay and Charles as "Yin" and "Yang" in terms of personality but the sum equals the total which is ultimate performance. Their system has a long resume of athletes and regular people to their credit so this is not a quirk. Check out the testimonials to their system here. So, let's talk hardware. The ARP POV Sport allows the body’s systems to respond more efficiently to work. The unique waveform produced by the ARP POV Sport measures muscle contractions and elongations during training. By using your muscles to the optimal performance and teaching them could result in increased strength, increased speed, increased joint and limb mobility, increased blood flow, reduced inflammation, and decreased recovery time. As an engineer, testing, measuring and correcting is the way to go, right? So, you've changed you diet and want to see if it helped you increase your brain activity using the new diet. Bio-hacking is all about trying something and see if it sticks. How do you measure brain activity. EEG has been a typical way to measure brainwaves especially in sleep research. Enter Jonathan Toomim and Hemoencephalography (HEG). In short, HEG measures oxygen the your bloodflow in your brain to measure an increased brain activity or capcity for activity. With EEG you had to use a conductive gel with electrode pads. HEG is quite a bit simpler as it uses just a headband over the head. Jonathan has taken over the research started by his grandfather and hopes to take this product more main stream. Jonathan been selling this system to people who follow his grandfather's research but is a little out of reach from the current everyday consumer. At first glance, bio-hacking actually seems a bit scary. A lot of the leaders here at the conference are called "bio-hackers" but most people here are trailblazers. They are no different than the tech entreprenuers who challenge the norms and make life better. Here the stakes are a little higher because they are doing things to their body to quantify effects. Dave Asprey is highly regarded for his hacking his own biology to get an advantage in business and enhance his family life. 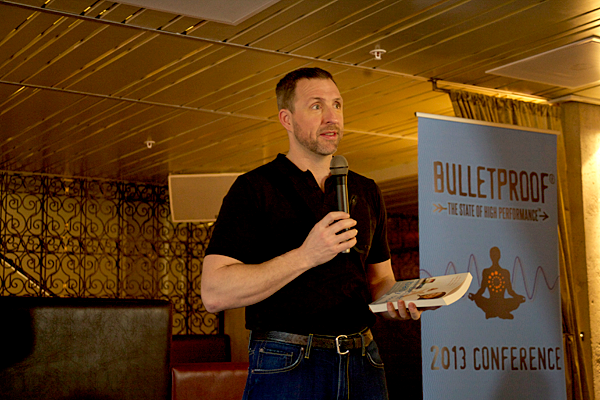 I have talked a majority of attendees and they are very passionate about the diet and Dave Asprey's blog. Check out Dave's blog, it is worth the read and decide for yourself if you want a life change.